Behind every athlete, is a person. Whether the person is a man, or a woman; a friend or a family member; it doesn’t matter. That person believes in the athlete. That person wakes up early on their days off, in order to drive with the athlete to far-off races. 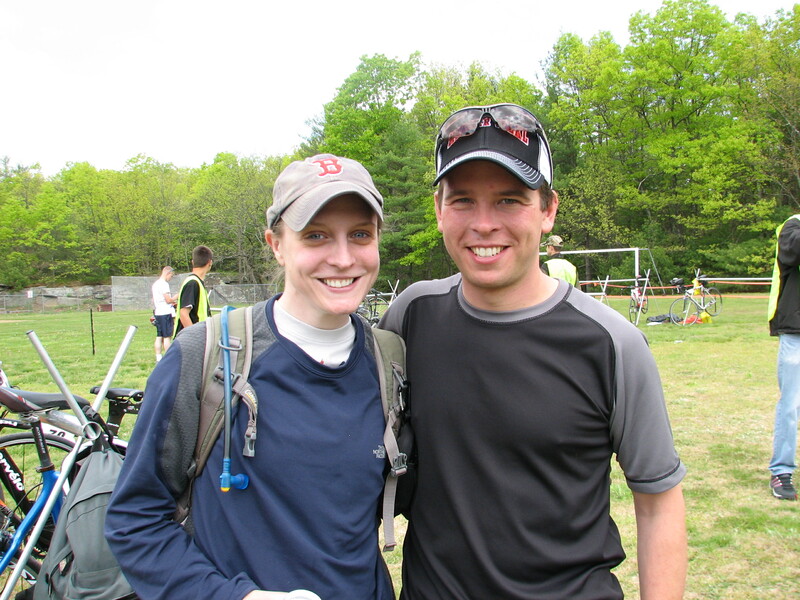 He sacrifices his own schedule to be with that athlete, even if the race is as short as a 5k race, a marathon; a mountain bike race or a triathlon. That person is the one who stands on the side lines, while the athlete prepares for a race. He stands by, as the starting shot goes off. He not only cheers for that athlete, he cheers for everyone. He cheers as the racers pass, and the racers finish. He willingly gives a helping hand to other participants, whether it be helping with a flat tire, or taking a photo. He is there at the end, with arms open wide, embracing the athlete, whether she finished first, or finished last. He is there for her. Because without him, she’d never be the athlete she is today. Nor will be tomorrow. And your never ending enthusiasm. It means more than words can express. If you have never been acknowledge before, let today be the first day that you are acknowledged. If you have never been thanked for being on the side lines, in the shadows, let today be the day that you are thanked. For even if you were there to be with a certain athlete, and/or racer, you were actually there for everyone. It’s been a week since my last post–work has been keeping me away from the computer. This week, I am not sure if it is because I had just fininished a great race and felt on cloud nice, and the fact my friends were there for me made all the difference in the world, but I feel odd. Probably because I was on two nights, off one, then back on three in a row, which can make you exhausted, or the fact I did no workouts last week, except for a small jog, and now I’m kicking myself for taking a week off, because my next race is at the end of april. But this “funk” I’m in, really needs to stop. Now. I think it all has to do with the “Runners High.” If you are a runner, or other athlete, you know what I’m talking about. The feeling of euphoria after you complete a great work out. I was so estatic the race was over, so happy and excited, and then, BOOM. Back to reality. And then, BOOM, feelings of almost… Depression. But, I have my bike tuned and ready for my long ride this week, and can’t wait to be out there, exploring more of Dutchess county, or possibly go over to Greene county….Who knows really. 6 x 3:00 up burger hill. Easy 3:00 jog down and recovery before repeating. After a monster work week, I’m actually going to get this done. 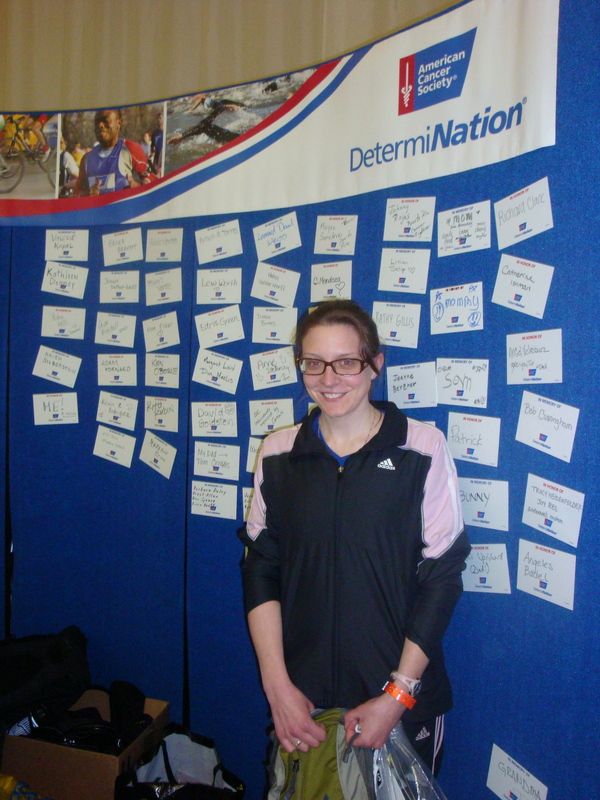 Man, I cannot wait for the next duathlon! Well, it’s over. First race of the season, and I must admit, the season could not have started off any better. The racing weekend started off on a semi-stressful note, as I somehow managed to lose my drivers license and credit card somewhere between Poughkeepsie and Grand Central Station, but without some sort of issues on a racing weekend, it just wouldn’t be right–at least in my case. 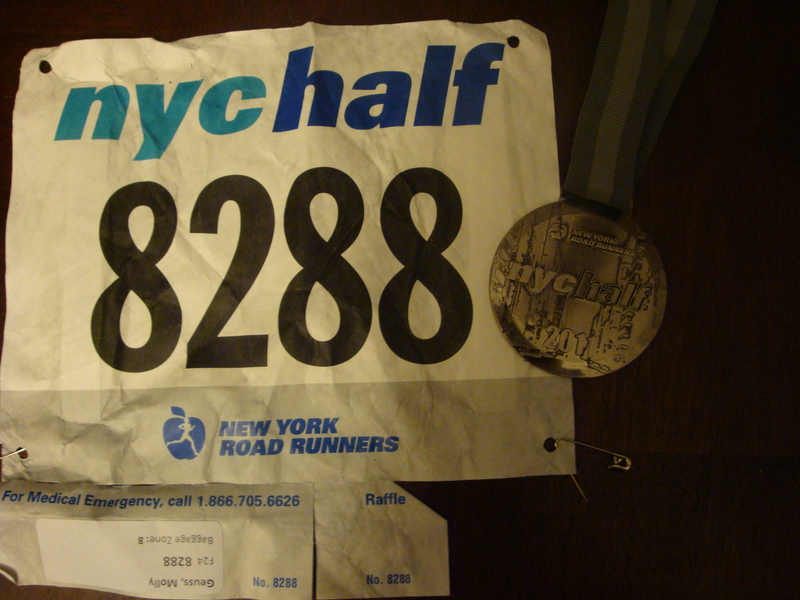 As mentioned in “part one,” I was able to get my bib without my ID–thank heavens,because it really would have sucked to be all the way in NYC to run a race and not be able to run in it. I’ll continue from where I left off last night before attempting to sleep. I did get a good 4 hours of shut-eye last night; my attempts to switch my body starting Thursday from nocturnal mode to day time mode was unsuccessful to say the least. I have a feeling if I decide to go pro, i might need to switch to working day shift, because the constant “back-and-forth” with sleeping during the day but needing to sleep at night before a race just does not work. Unfortunetly, I don’t see myself switching to day shift anytime before the “big race,” so I’ll need to grin and bear entering races already exhausted. A positive, though, was that I was up at 0300 and was able to hydrate and eat and let it “digest” before starting the run, hence not having to run with the feeling that you have a brick in your stomach. Up at 0300, filled with anticipation and excitement, like other races I’ve done, I hydrated, and decided to eat that gu gummy blok. As I’ve mentioned before I’m just not a fan of eating while exercising, dont like anything gummy or sweet–which rules out most energy bars/gels. However, the lemon flavored gu energy block I ate tasted fan-tast-ic. I’m not sure if it was because I was incredibly nervous and that is the only thing I could manage to eat before the race, or that my body just craves more sugar, electrolytes, and caffeiene, that if i had a whole box infront of me, it would have been consumed in less than five minutes. 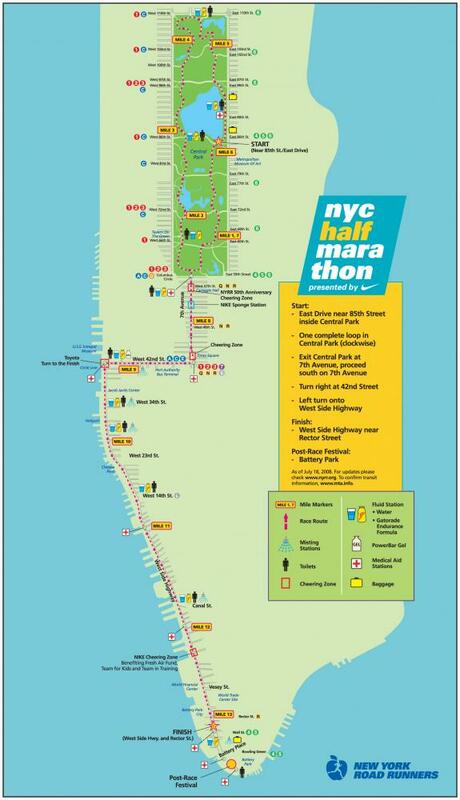 Picking a hotel that had a shuttle to the starting are–let me correct myself, booking through an agency linked with NYRR and the race–saved a lot of grief when it was time to leave. If you are looking for a place to stay before a race, and the race organizers have certain companies they are partnering with (be it hotels or whatnot), make sure you book through that company. There were a lot of runners who stayed at my hotel who did not book through that agency, and, my heart went out to them, because the shuttle was only for people who were with the agency. Just a heads up. 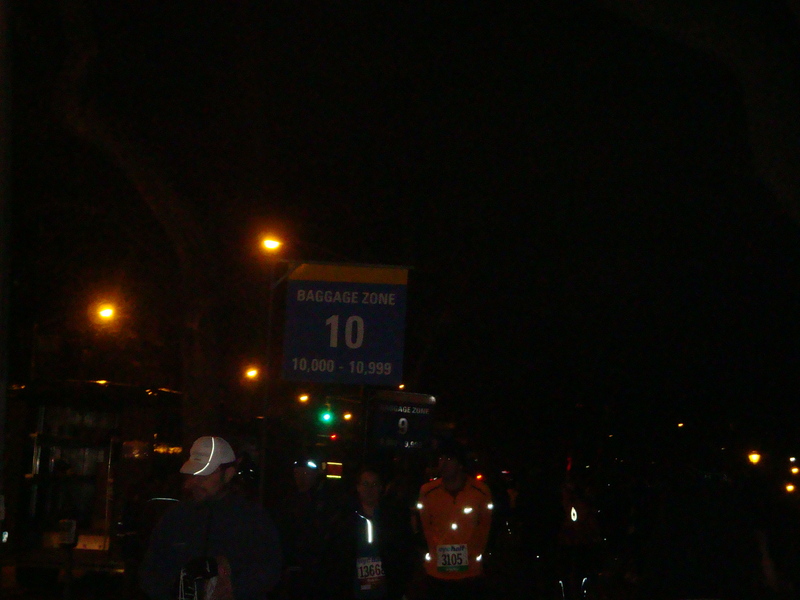 The race was extremely well organized, and had bag drop-offs according to your coral number. Each runner also had a brightly colored sparkly ID band which allowed them into the coral zone (I love sparkly things). We got to Central Park by 0610, and it was quite chilly. Next time, I’m going to wear a crappy pair of sweatpants with the crappy shirt that I can keep on until the race starts, because I was on the brink of hypothermia wearing shorts, the t-shirt, arm warmers, gloves, and a thin cotton long sleeved shirt on. I advise that you wear something that you don’t mind throwing out to wear after you check your bags, because there is a heck of a lot of waiting around before the race starts. 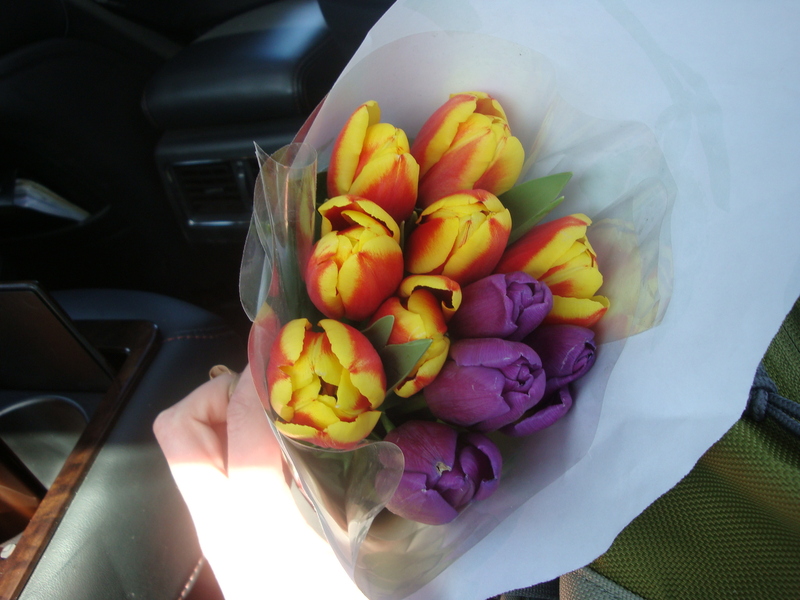 And, even though it was above freezing, it was still 33 degrees and the sun wasn’t out yet. (That was lesson one). 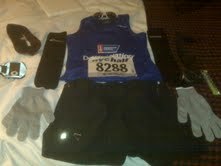 Lesson two is that you should not walk for hours around New York City the day before you need to run 13.1 miles. Because that is not considered rest, especially if your feet hurt and you haven’t even run the race yet. I met up with the other members of the DetermiNation team at 0630 and continued to wait and freeze, making new acquaintances and taking team pictures. It was nice “knowing” people in the race, even if i had just met them. They were all in the same boat. 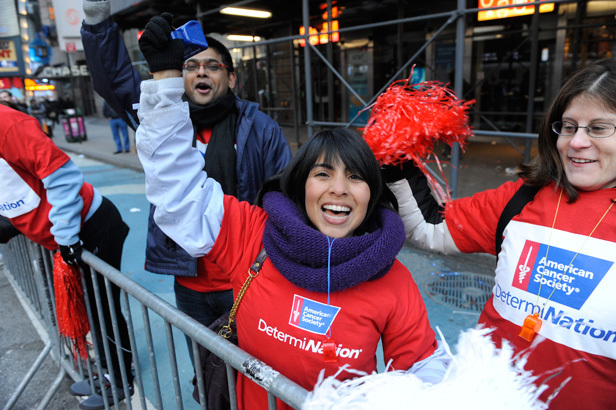 The DetermiNation team coaches were awesome, upbeat, and at different points along the race course to cheer you on. It was around 0645 when we finally took a whole group picture and made our way to our different corals that the gal I was talking to started to mention the hills on the course. “There are hills in New York City? I thought it was just flat,” was my dumb struck response. Since I’ve never been to Central Park, I had no idea what to expect. Considering I’ve done trail running in the Gunks and Catskill mountains, the panic feeling I had about the inclines went away (kind of). From around 0650 to 0730, there was standing. And waiting. And teeth chattering, as all the 10,000 runners stood in place trying to keep warm until the race began. A neat thing was that I saw Central Park in the dark, and was there when the sun was rising, and as the temperature rose to 37 degrees. I met some fellow runners whose lips were just as blue as mine, and matched my blue DetermiNation T-shirt, and prayed that the feeling in my legs would come back before the start. *This is the time you want to be wearing the throw-away sweats–standing in the cold is miserable. And, once you shed them at the start, you are doing the homeless people a favor by giving them free clothes! Heaven forbid you find yourself living on the streets and can no longer afford to buy clothes, just head to the nearest race start, and you’ll find a whole new wardrobe of clothes! After the NYRR organizers speeches and introductions of all the famous runners whose names i can’t remember because I wasn’t paying attention due to the incessant teeth chattering, the race started. It was a nice loop around Central Park (I had no idea Central Park was so big), and by mile 2 I was pretty warmed up and feeling good. It was a picture perfect day for a race- blue sky, sunny, a tad chilly, but I’m not going to complain, since there have been races I’ve done where its 98% humidity and 90 degrees (that is hell). After completing about 6 miles, the course headed down 7th avenue, which was by far the best part of the race. Scratch that, the best part of any race is when you are done. Running down 7th Ave was the most memorable part of the race. I’ve been to NYC only a couple times before, and it’s always been crowded and people bumping into each other trying to avoid all the tourists taking photos of every billboard imaginable. There was still bumping into each other, it’s just that the bumping was faster, since it was now runners running into each other at the water stations. It was awesome. The people on the sides of the roads cheering for you as you ran down towards Times Square where cars usually are was incredible. I would have taken pictures with my phone, but thought it would look too weird snaping pictures of buildings while running a race. Similarly, the texts I was going to send to my friend never occured because, again, I felt it would be weird texting and running at the same time. I feel it’s a racing faux-pas to be on your phone texting. So, I didn’t. (And, the zipper to the pocket holding my phone was stuck, therefore i couldn’t even get my phone if I wanted to). I was feeling pretty good, running faster than my anticipated 10minute miles (yes, my goal is that slow). 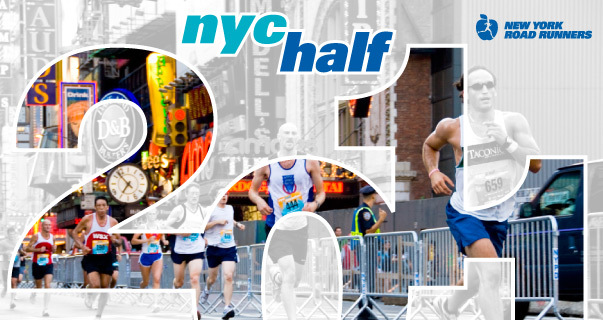 After passing times square, I think the adrenelin started to wear off (around mile eight) and I began to wonder how I ever ran marathons because I was beginning to feel the run.And then the thoughts of “wait, why do I think this is fun again?” begin to creep into my thoughts. 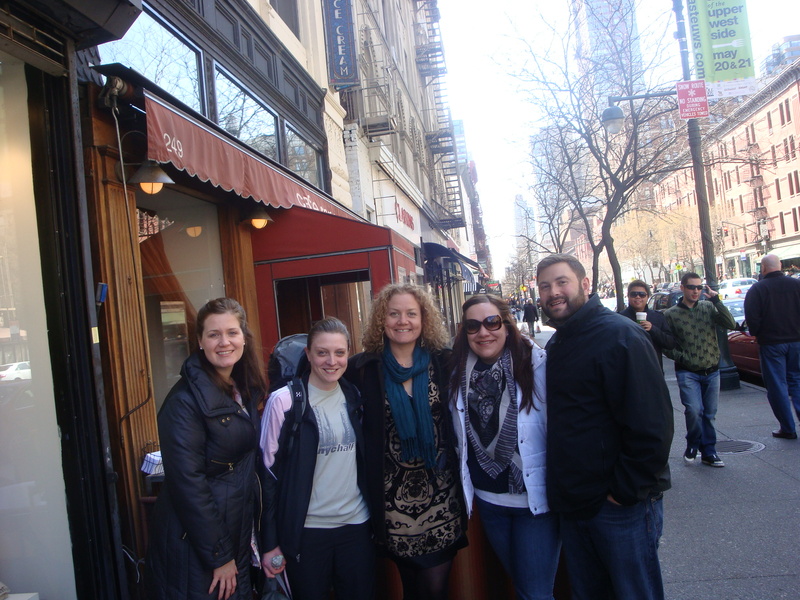 But the cheering was helpful, and I was able to keep my mind occupied by taking in the sights of the City. The last three miles were along the water on West Side Highway. Even though the distance was only a half marathon, those last three miles seemed to be painful. It’s like other races–the last leg is just horrible, because you know you are so close to the finish, and yet still need to continue to run. 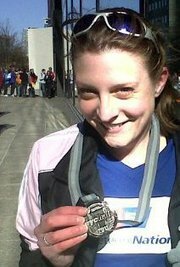 (I still don’t know how I ever managed to run marathons). Finally, after 2hrs and 2 minutes, it was done. In retrospect, it went really quickly. And with my fatigue and lack of rest, I was content with how I did (okay, I really could have done better, but, whatever, I was doing it for “fun”–and yes, I just said “whatever”). Despite the thousands of people (literally, thousands) at the finish line, I was able to find my most dear and amazing friend, who was waiting at the end at 0930 with camera in one hand, and flowers in the other, for me. There really isn’t anything better than being greeted by a familiar face, especially in a city like New York, and especially if it’s the dearest, most thoughful friend and reason you were running the race. That was definitely a highlight, thank you, T.Linscott. You’re a rockstar. This brings me to my third lesson: it’s virtually impossible for the majority of runners to look presentable and not like complete disasters after finishing races for the pictures. Yes, snapshots are required of you after you have completed any distance race–whether it be 2 miles or 60miles. Pictures are a reminder that you accomplished something, no matter how big or small it might have been. But I’ve learned after 99.9% of the races I have finished, there is just no humanly possible way for me to look like I’m pain-free and happy, when in reality, I’m estatic that the race is over. I always appear to be a miserable mess, and really do envy people who can complete races and are in mint condition. I really want to know their secret to how they look incredible. If you are one of those people who look incredible after a race, tell me, what is your secret to looking amazing? Anyway, after picture taking (my attempts to look somewhat presentable for the photo shoot were very unsuccessful) and getting situated, we headed back to the hotel where I could finally get warm, which brings me to lesson numero quatre: pack sweatpants to wear post race. When you are finished running, you are sweaty and warm, but if it is a blistery cold windy day like it was this morning, the sweat and heat is replaced by ice. There is a reason for why runners get those gray shiny aluminum looking sheets (in all honesty I forgot the technical name for them) after they finish. They really help keep you warm. In the bag I checked, all I put in it was my warm-up jacket, and that was not enough, even with wrapping the shiny sheet around my legs like a towel. I was so thankful to have T.Linscott with me and guide me back to the hotel, as I really had no idea where we were. I keep forgetting NYC is so big! I took a quick shower, checked out of the hotel (and learned you don’t have to literally “check out” in hotels–you can express check out!) and lugged my big hiking bag garbed in a sweatsuit, passing women in the lobby wearing coats and bags that cost more than my car. We met some fellow Kingstonians for brunch at Cafe Ronda which was very good, and I highly recommend it if you are in that area of the city and want brunch. After a delicious meal we headed back to my friends car (they had driven down, and had an extra place for me). One of my favorite quotes of the day is when Povill said to me, “You know, you look like one of those high schoolers who are traveling with their sports team in your addidas sweatsuit lugging that huge hiking bag around.” (Lesson 5: it is vital to have your track suit color coordinated. It just so happened the pink strips on my sleeves matched the pink on my sneakers). 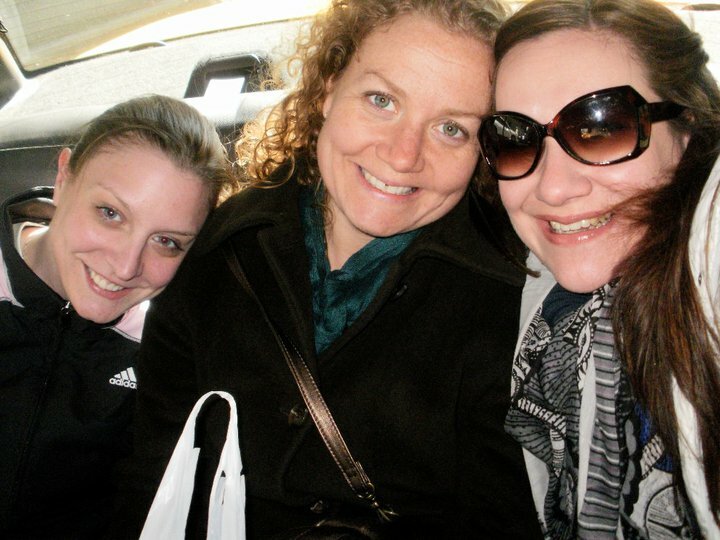 The short road trip back from the city to Kingston/Poughkeepsie, where I had parked my car, was full of singing along to songs, laugher and jokes. Being surrounded by the people I love just made the day even more special than it already was. Many of the races I’ve done, I’ve done alone. Going to and from race location by myself. Today I realized the importance of friendship, and how it’s so much more fun when you have other people doing the race with you, or on the sidelines cheering for you. I was blessed with friends like that. All in all, the race was awesome. 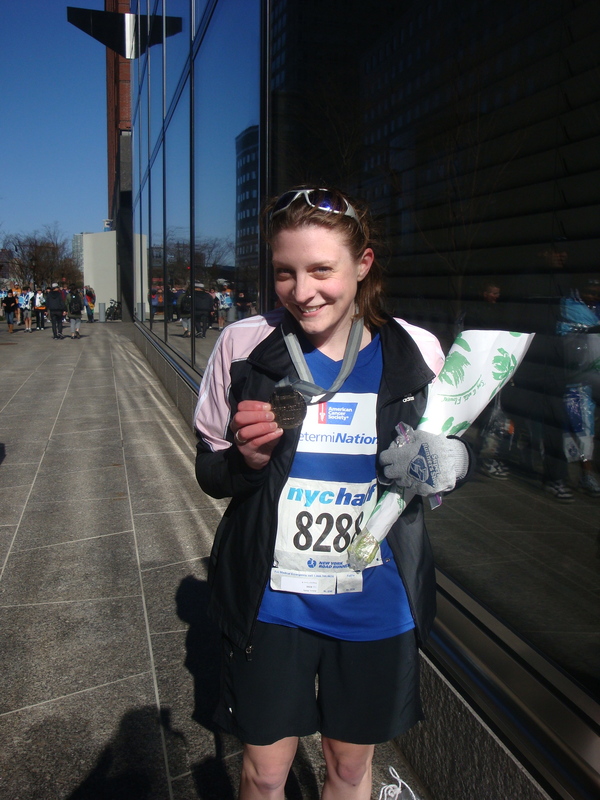 Being able to experience what it is like running such a big race (well, I guess the Boston Marathon was just as big) through the Big Apple was an experience I will never forget. I definitley recommend it to people looking for a good half marathon to do. As I sit with my compression socks on and my sleeping cat by my side, I can’t begin to fathom how my body will deal with the Mooseman that is coming up shortly. I guess the quote below sums it up. Below is a link to a video of the race–take a look–you’ll want to do it next year for sure! Today was awesome. Thank you, NYRR, for an awesome race, and special thanks to T.Linscott for being at the finish line,J.Povill for holding my backpack, and N. Conklin for the laughter in the back seat. The perfect song for the perfect day. I’m here! New York City–the “Big Apple”–the “City that never sleeps” and just checked into my very fancy hotel room after meandering through the city streets. The sweet smell of polution and the honking of horns blare outside my window. There is a reason why I live in the country. I made it safe and sound after taking the train south, hoping to catch a few zzz’s while the train rumbled on the tracks but alas, if this girl cannot sleep during the day, there is no chance she’ll sleep on a train…Or tonight before the race for that matter. Now, for you runners/triathletes/cyclists…or any race you are in. Tell me, what are the two things that you need in order to pick up your bib number? Your confirmation email of registration, and YOUR IDENTIFICATION. Then the panic kicked in. What if they don’t let me race? I can’t go all the way back to Rhinebeck to get my passport and then come down. Is this really happening to me? 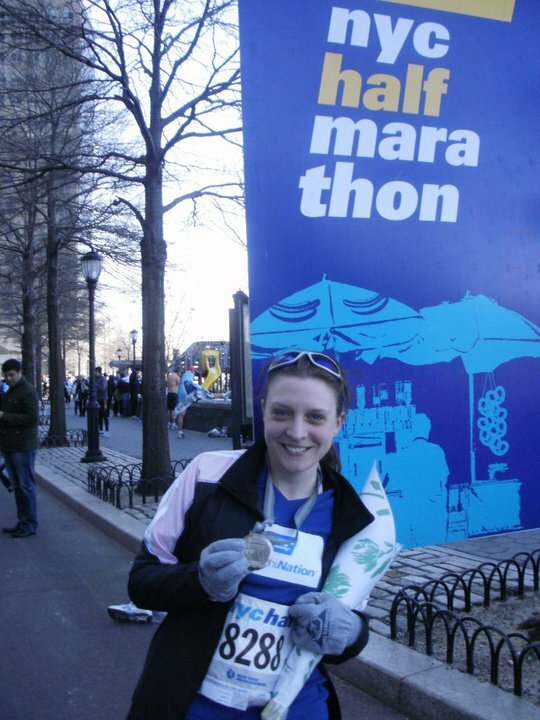 Thankfully, I was able to get my prized NY half t-shirt (only do races where you can get shirts! All my racing shirts are like a racing diary) and not have to sit out on this race. I met the other people from the team DetermiNation, who were all great. Thank you to all of you who donated– the American Cancer Society raised over 200,000 dollars– thats the most any charity has raised for a half marathon. 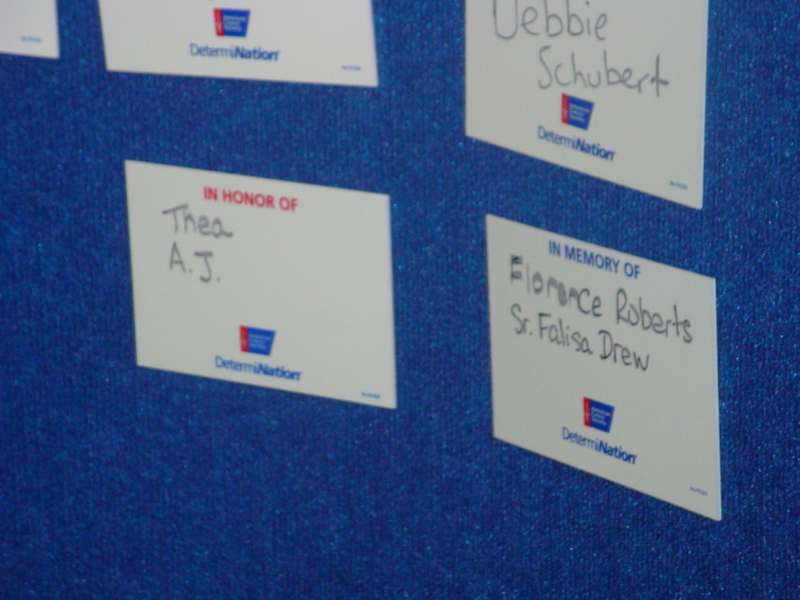 Not only do i thank you, but millions of other people living with cancer are thanking you as well. And if you still would like to donate, just let me know and we can work it out. I walked around times square which was bustling with tourists and people throwing paper advertisements at you. Can you imagine the amount of energy they waste on all those neon signs?! ?I acted like a complete tourist, and really should have gotten a map (my earlier words: Pshh, I don’t need a map, how lost can I get?–those were my famous last words). 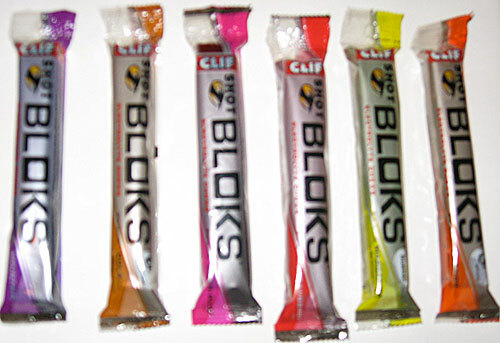 I zigzagged my way through the streets and managed to find gatorade and cliff shot bloks, which I have never tried on a run before and might be having one tomorrow…I know you should never try something new in a race, but I need to try them at some point. Plus, I already paid for them. On my long runs, I’ve never eaten food, just drank lots of water….We will see. I should probably hit the sack now…Part two will be here after!